The big shot independent authors tell me that in order to make enough money to quit our day jobs and write full time, we have to don a creative straight jacket. You see, Amazon’s algorithms have churned through two decades of data and discovered that readers are one trick ponies. They read one genre and rarely stray from their comfort zones. In an effort to sell as many books as possible, Amazon’s Artificial Almost-Intelligence prefers to dangle a person’s preferred genre in front of them. Bryce Beattie, editor of StoryHack magazine defies that conventional wisdom by planting his genre flag on the hill of ACTION. 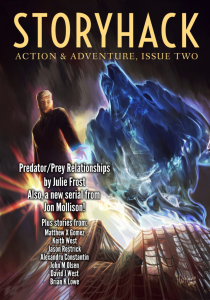 Sci-fi, fantasy, weird west, modern day, urban fantasy, steampunk, you name it – if it’s a story with action and adventure, he’s got room for it in StoryHack. That’s my kind of diversity in writing! You have to admire a man with a vision that cuts across the grain and makes it work. Rather than suffering for having no audience, StoryHack is primed to capture every audience. It might not appeal to fans of any particular genre, but it holds appeal to fans of every genre. When it comes to doing one thing and doing it well, StoryHack decides that one thing will be pulse-raising stories that feature real stakes, real heroes, and real adventure. Who doesn’t find pleasure in stories like that? Not the sort of reader I want to please, I can tell you that. And that’s why, when Issue One was noticeably light on modern day action, I stepped up and offered The Gambler’s Tale, which shows up in Issue Two. It’s the story of a gambler, (surprise!) with a plan to take on a mob run underground casino. High-stakes gambling. Fistfights. Chases. Daring escapes. Hot dames and cold drinks. It’s got everything a reader could ask for – maybe not the timid readers who stick to a single genre. But definitely for those adventurous readers who are up for a little adventure themselves.